Under the banner of Promilla & Co., Publishers, we publish outstanding works, mostly non-fiction of academic and general interest, in the English language. We cover a wide range of subjects: Historical Studies, Futuristic Studies, Bibliographies, Encyclopaedias, Biographies/Memoirs, Gandhiana, Sufism, Sindhology, Religion & Philosophy, Indology, Music, Performing Arts, Film Studies, Economics, Politics, Strategic Studies, Terrorism, Human Rights, Sociology, Literature/Poetry, Folk Arts, Travelogues, Gender Studies, South Asian Studies�. We are internationally well known for maintaining high publishing standards. Headquartered in New Delhi, India, Bibliophile South Asia is a reliable source from where you can acquire all types of books from India including publications of NGOs, research institutions, think tanks, political parties, government departments, universities and commercial publishers, without any hassles. 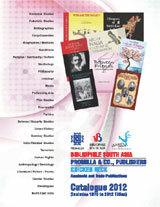 We also offer business solutions to various needs and queries about publishing and distribution in the sub-continent. We offer consultancy to foreign publishers for doing business in India. We assist NGOs, schools, colleges and universities in the acquisition of all types of publications to build up their library collections. Bibliophile South Asia has a Print Production Unit to render high quality print production services right from the manuscript stage till the finished product including labelling and despatch. Typesetting, formatting, designing, editing, proofreading, printing and binding are done by highly qualified and experienced professionals. We have been undertaking turn-key print-production jobs for Delhi Policy Group, Bhartiya Vidya Bhawan, IDSA, UNESCO, Richfeel and various other institutions.